The story of 'Paquita' and her subsequent progeny, is very much about the interplay of the original American bloodlines behind her sire and grandsire, 'Casa Gatos Da Foong' and 'Casa Gatos Darkee' respectively and what each of these males brought into the gene pool with them. 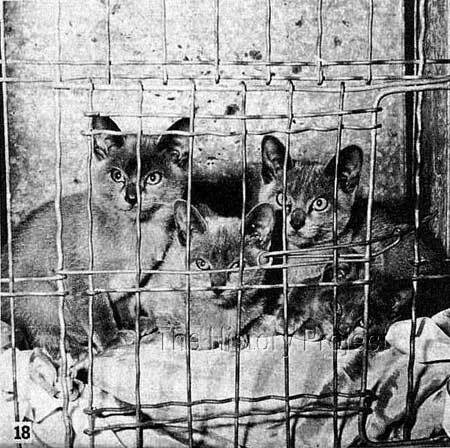 In 1953, Mrs France, assisted by the late Lord Aberconway, imported another male, 'Casa Gatos Darkee'.2 It was from various combinations of the lines of these two 'Casa Gatos' males and their sons and daughters, that enough breeding stock was eventually established in the United Kingdom to allow Burmese kittens of sufficient quality to be available for export to breeders located elsewhere around the globe. 'Paquita' was born on 11th June 1956, sired by Mr. and Mrs. Watson's 'Casa Gatos Da Foong' and out of Mrs. Dunn's queen, 'Kyneton Aka'. Her dam, was sired by 'Casa Gatos Darkee', and her maternal Grand-dam was 'Chinki Amber', also by 'Casa Gatos Da Foong'. So 'Paquita' was in fact the product of a grandsire to grand-daughter breeding (based on a line-breed of her sire 'Da Foong') and as her Grand-dam was out of USA Ch. Laos Cheli Wat, she was in fact from all American lines, but born in England. Cats contributing to the creation of 'Paquita'. Left: Sire, and maternal great-grandsire, 'Casa Gatos Da Foong'. This line-breed on 'Da Foong', then out to 'Darkee' (considered to be a reasonable outcross) and back to 'Da Foong' gave 'Paquita' a fixed genetic make-up that was predominated by her sire 'Casa Gatos Da Foong'. Mrs. Beryl Sedcole, with her three initial Burmese imports from the United Kingdom. Left to right: females 'Paquita', and 'Nilgirus Buru Kaihau', both daughters of 'Casa Gatos Da Foong', and the male, 'Merrick Apollo', a son of 'Ch. Casa Gatos Darkee'. The most significant sire sibling of note in this case was 'Nilgiris Buru Kaihau', born, 26th April, 1956, bred by Dr. and Mrs. Groom, as it was she who was exported to New Zealand along with her more than three-quarter sister 'Paquita' and the male 'Merrick Apollo' who was a son of 'Casa Gatos Darkee' and grandson of 'Da Foong'. GR CH Tomahawk (Imp.UK), the first Burmese to arrive in Australia. Litter brother of 'Paquita', one of the first three Burmese to arrive in New Zealand. 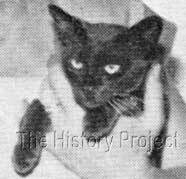 At the Hamilton Cat Club show of 1957, Judge Mrs. Bernice (Bunny) Downey, had placed 'Buru Kaihau' ahead of 'Paquita' in the class. This somewhat surprised Mrs. Sedcole, who had been told by the English agent that she expected 'Paquita' to do better at shows and that 'Buru Kaihau would be a useful brood queen.2 It therefore appears possible that the decision of Mrs. Downey to award a first to 'Buru Kaihau' and a second to 'Paquita', may have played some part in the fact that it was 'Buru Kaihau' who first gained her Championship. 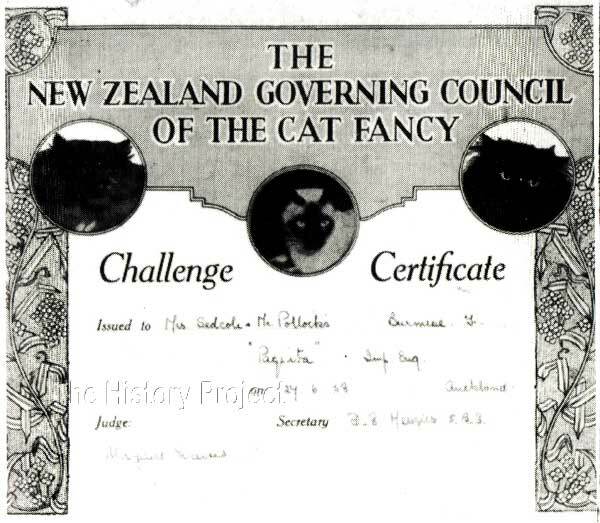 Confirming the progeny of 'Paquita' presented the writer with some difficulty, as Volume Three of the NZ Governing Council of the Cat Fancy's Stud-book, appears not to have been published. This would have covered the period between the end of Volume 2, (31st December, 1954) and the start of Volume Four, in the late 1950s. Fortunately copies of the pedigrees of Mrs. Sedcoles imports are preserved, and details of their New Zealand registration, can be found in Grace Burgess's invaluable book, 'Burmese Cats' published in 1970. 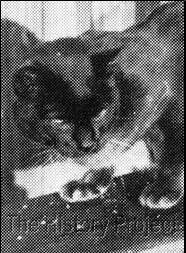 Grace also provides a list of the names of 'Ransein' cats exhibited at major New Zealand shows between 1958 and 1963. But although we find the names of the cats in this publication, it does not identify the parentage of each exhibit. So this information has had to be gathered from a combining research of old pedigrees and examining early Australian studbooks. Although there were clearly a good number of progeny from 'Paquita' that were both retained and sold for breeding, her main claim to fame is as the dam of 'RANSEIN TALISMAN'. 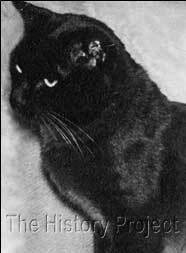 This was a Sable Burmese female for whom we have a pedigree but no date of birth, but who was sired by Ch. Merrick Apollo (Imp.UK) and out of 'Paquita' (Imp.UK). 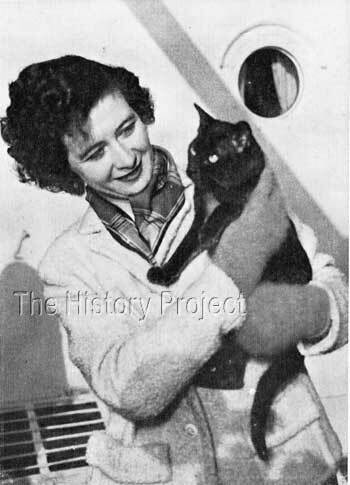 Records show that 'Ransein Talisman' was shown at Auckland Cat Club's 11th Championship Cat Show in 1960, and among the other Ransein cats exhibited at this show were 'Ransein Silmarein', 'Ransein Venus' and 'Ransein Trinity'. We do know that 'Silmarein' was out of 'Nilgiris Buru Kaihau', but we do not know for sure at this point who the dam of 'Venus' or 'Trinity' was, so they could have been out of 'Paquita', given that Paquita was the first to breed successfully. 'Talisman' is known to have produced a litter in April, 1960, so she must have been born no later than 1959 and possibly as early as 1958, possibly in the first litter from 'Paquita'. "Mrs. Sedcole told me that one of her Burmese kittens which, for no particular reason was named 'Talisman'. One dictionary I referred to gives the definition of 'talisman' as: 'something producing wonderful effects�' Mrs. Sedcole's dictionary said '�the source of something strange and wonderful'. "Ransein Talisman was most aptly named because, mated to Merrick Viking, in 1960 she made history when she produced the first All-blue litter born in the southern hemisphere. 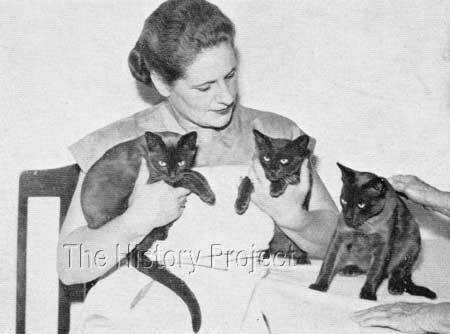 These kittens were born on 12th April, 1960, and registered with the NZGCCF on 28th June, 1960. 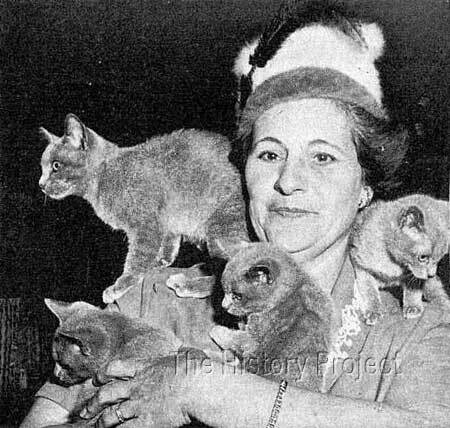 Mrs. Beryl Sedcole, with her famous litter of four Blue Burmese kittens, all grand-children of 'Paquita'. Sired by 'Ch. Merrick Viking (Imp.UK)' and out of 'Ransein Talisman', both Sable Burmese. In fact, breeders in England had been considering where the dilution factor for blue had been inherited from, and in the case of those born in England, it was determined that the carrier of the dilution was 'Casa Gatos Darkee'. He of course, was the sire of the first Burmese male imported into New Zealand which was 'Ch. Merrick Apollo', but the father of this litter was 'Ch. Merrick Viking'. However, although 'Viking' was sired by 'Ch. Darsham Khudiram', his dam was 'Merrick Ana', a full sister to 'Apollo'. Hence 'Viking' probably inherited his genes for the dilution from his dam (who was by 'Casa Gatos Darkee'). In addition, both of the females imported by the partnership of Sedcole and Pollock, 'Paquita' and 'Nilgiris Buru Kaihau' were also grand-daughters of 'Darkee' and so it now seemed likely that 'Paquita' had inherited this dilution and passed it on through her daughter, 'Talisman'. The four 'Blue' grandchildren of 'Paquita' on exhibition at Gisborne in August 1960. 'Amelia', 'Angel', 'Andrae' and 'Andante'. At the time, they were the only Blue Burmese in the Southern Hemisphere. "This all-Blue litter was, naturally, of great interest throughout the Cat Fancy world and the most astonishing thing about it was that both sire and dam were brown, with no blue in their pedigree as far as it has been possible to ascertain. As a result of this litter, which proved that it was possible to breed Blue Burmese from Brown Burmese, Mrs. Sedcole told me that the Governing Council of the Cat Fancy in England decided that Blue Burmese were entitled to their own breed number and Blue Burmese were allotted Breed No. 27A in July, 1960. 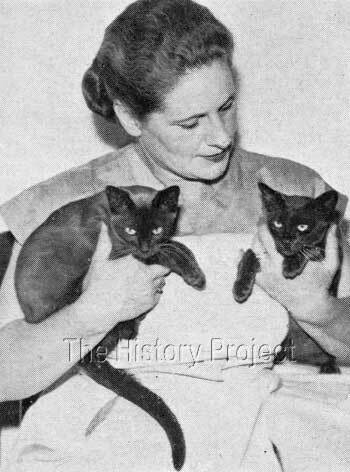 "The two female kittens from this all-Blue litter litter were absolutely identical so that even Mrs. Sedcole couldn't tell them apart. The two male kittens were as different from one another as it is possible to be." The author then gives us the names of the males, which were 'Ransein Blue Andrae' who became a well-known and lovable stud cat. His litter brother, was 'Ransein Blue Andante' who became a much-loved pet. And from researching pedigrees, the writer has deduced that the names of the females, were respectively 'Ransein Blue Angel' and 'Ransein Blue Amelia'. At the time of writing, it is known that there were probably many more sons and daughters of 'Paquita' sold for breeding, but as yet they remain unidentified. 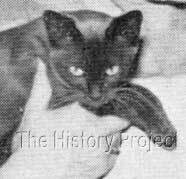 In 1958, two Sable Burmese females, 'Ransein Fu-Yen' and 'Ransein Hyraji' were exported to Mrs. Harold Abbott, (prefix Eastern)2 and it is likely that at least one of these was out of 'Paquita', if not both. New Zealand 'Challenge' Certificate awarded to 'Paquita' dated 27th June, 1958, at Auckland; now well on her way to Championship, which was achieved on 12th July, 1958. These early 'Challenge' certificates, issued by the NZGCCF, were quite enormous. They were printed on a very heavy cream card, the design being printed in black and red ink, featuring photographs of three famous English imported cats, which were respectively, the blue Persian male, 'Ch.Merryman of Dunesk', the seal-point Siamese male, 'Ch. Spotlight Pride', and the black Persian male, 'Ch. Slapton Black Magic'. All were owned by Mrs. Bernice Downey. The approximate size of the certificate was 12 by 16 inches! The story of 'Paquita' is that of the first American Burmese bloodlines to come to the shores of New Zealand. It is also the story of the earliest development of the Burmese breed in New Zealand and of the sharing of those lines throughout New Zealand and Australia. It is also the forerunner of the birth of the Blue Burmese in the Southern Hemisphere, and how it was possible to produce an All-Blue litter from two Brown parents, with no recognisable blues traceable on their pedigree. But it is equally a story about the leap of 'faith' that breeders take, when they seek to buy new stock from reputable breeders overseas, and of the faith they have in the genetic inheritance, often which lies dormant in the cats that come into their care. In this sense, the breeder is like an explorer. They accept their charges and care for them, they learn to love them, and then learn to appreciate that there is far more to a cat than that which we see before our eyes. They that are in truth, a genetic package, containing mysteries which are yet to be uncovered. 'Challenge Certificate', Mrs. Beryl Sedcole.